Happy Thursday! Woohoo! Almost the weekend (kind of). Next week is going to be crazy for me so I know I'll be enjoying this weekend to the fullest. Today I'm wearing one of my favorite combos-to-date. 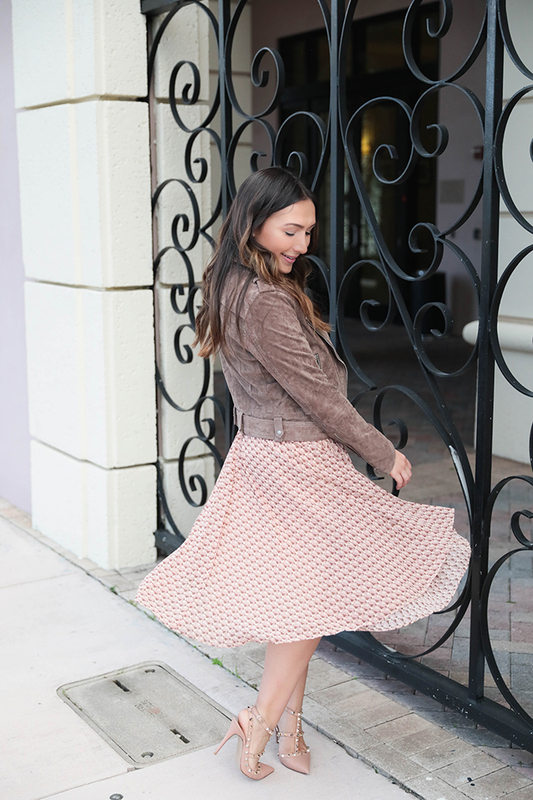 This suede moto jacket is my absolute FAVORITE and right when I got this skirt in, I knew that they would be the perfect match. It's the perfect mix of feminine and edgy. If you know me, you know I'm not that much of an edgy person. My wardrobe is 90% filled with feminine pieces. Switching it up sometimes is fun, right? I absolutely love this suede moto jacket. It's perfect for fall and winter. While it can be a little pricy, this is an investment piece that you will thank yourself for buying years from now! I got it during the Nordstrom sale and am so happy I did. Then comes this pleated skirt. Ah! Pleats are extremely in for fall/winter and clearly I am loving the trend (already wore pleats on the blog this week). There's just something I love about this outfit and I can't wait to wear it again and in different ways once it starts to cool down in Miami! Anyways, I hope you all have a great Thursday and thanks so much for stopping by. Tomorrow I'll be doing a fun post sharing my favorite pieces from taudrey and why I love them. The post Suede and Pleats was first shown on The Fashionista's Diary.